So often, I realise, people do not have a clue about what market research is, but they definitely have a perception that we are those nasties who phone you at the wrong time of the evening to ask you a whole heap of questions you really have no inclination to answer – and yes, be honest, we have all been known to be a tad curt, or even put the phone down! Questionnaire or survey-based research is invariably quantitative in nature. 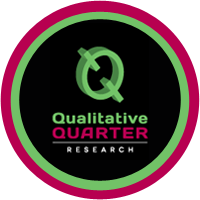 Folks, we do quantitative research as well, but QUAL QUARTER IS A QUALITATIVE CONSULTANCY!!! So what does that mean? What do we do at Qual Quarter? We are curious about what drives people’s behaviour – whether it be what cars they drive, what yoghurt they drink or who they vote for. There are reasons behind all the decisions we make, and these are affected or influenced by our cultures, psychographics, where we live, socio-economic conditions, family, etc, etc. So we TALK to people, we interview people, we deep dive into their lives and find out what makes them tick. AND this is not done by asking them a few questions on a telephone! So here’s a thing: a few weeks ago we phoned a lady and asked if she could assist us with an interview we would like to do. A more willing person we couldn’t have wished for! Yet, when phoned by a colleague of mine yesterday, the same lady asked what it was in connection with, and my colleague said ‘We are a market research company…’ – Before she could go any further, this person replied: ‘Please don’t phone me again’. And put the phone down. Misperceptions methinks? So, just a little illustration. We take our work seriously and we inform a myriad different topics and industries. In fact, without market research many companies would be unable to make informed decisions about their marketing and where their products/services are placed in the market, nor would they be able to improve that positioning! I do hope this gives an idea of what we are all about. Oh, and those ‘quanties’ who do the question asking? Be kind to them, because for many of you out there, the qualitative research is seen as way too fluffy and non-scientific, but quantifying data can turn it into a perfect science! If you have a product or service and you don’t know where it sits in the market place, or would like to find out, or even if you have a concept you would like to test, give us a call. Let us help you find the solutions.